We are using version 5.2.2 of DDS. We have delivered the program using DDS. The customer's DataWriter pauses and then resends after a few seconds. We think this is due to the Qos configuration, but we are not sure. Could you give me some advice on this situation? I am not sure I understand. What do you mean by "our program is kill process". Do you mean that program has been killed using a "kill" signal from the Operating System? Or do you mean something else? 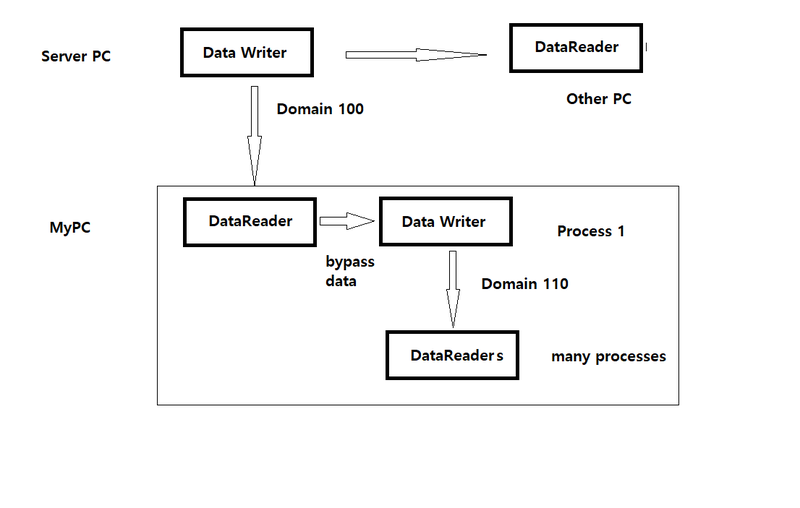 Is the program that is killed the Subscriber receiving data from the customer's DataWriter? So, assuming I understood, what you are saying is that the customer's DataWriter gets temporarily blocked when you kill your Subscriber application? It is the form of my system. It is said that other PC does not receive data of server PC. The customer says it is paused. I will guess that you are using strict reliability. In such a case, a reliable writer may block when you try to write new data. A writer will allocate resources so that it can hold samples in memory until they are acknowledged by all relevant readers (readers that were matched when "write" is called). If a reader (like the one in your process) is suddenly killed (not gracefully shut down), the writer may view this reader as an unresponsive reader. Until the writer detects that the reader is "dead", it must store all the samples it sent the "dead" reader. This is (I'm guessing) what you are experiencing. 1. set the writer to keep last (instead of keep all) - this will mean that reliability will only ever be enforced for the last x samples per instance (this may be useful for scenarios where the last x values are important but not ALL values are important). I will solve the problem together.